Gentleman, scholar, WWII officer and hero, Tuskegee Airman, outspoken Past President Board of Education, Owl Club member (forever), Lifetime Sertoman - this is just the beginning. Omar D. Blair graduated from Albuquerque High in 1936, one of six black graduates out of a class of 600. He attended the University of California in Los Angeles prior to entering the Army Air Corps (now known as the United States Air Force). Omar has continuously proclaimed that "The kids are what it is all about." He courageously demonstrated this commitment while serving on the Denver Board of Education for two terms and elected as the first African American to serve as President of the Board. Prior to his school board service , Omar served as Commissioner of the Denver Urban Renewal Board during which time he and his colleagues initiated the 16th Street Mall project that is a national model of renovation and beauty. Omar has been honored many times, as demonstrated by dozens of plaques and certificates. In 1984 Omar received an honorary doctorate from Metropolitan State College of Denver, "Doctor of Public Service" for years of service to education. 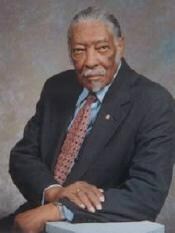 On April 26, 2003 the city of Denver recognized his lifetime of service by naming the African American Research Library the Blair-Elvin Caldwell African American Research Library.